Whether you’re a frequent traveller, seasoned camper or more prudent person, incidents or discomfort can occur at any time. Therefore, it is better to always have a first aid kit in your luggage or at home so you are prepared to handle the unexpected. 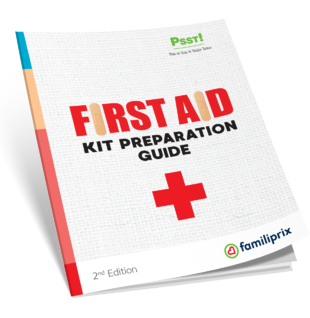 This kit should include the medications and accessories you’ll need to provide basic care in case of minor injuries or sickness. Some first aid kits are sold in stores, but they are often incomplete and expensive. For these reasons, we recommend that you prepare a kit yourself that will truly meet your needs. You should consider its purpose, such as for use on a trip or at home, etc., who it will serve (children, adults, etc. ), and the amount of space you have to store it. Our guide is designed to help you make an efficient, functional kit that suits your needs. What to put in your kit?